After the decision to strip the Grizzly Bear (Ursus arctos horribilis) of federal endangered species protection last year, bear deaths are rising. Grizzly bears usually die prematurely from human causes. Only three of the recorded 51 bear deaths in the contiguous United States this year were classified as natural. The rate of deaths is shocking: nearly one bear every two days since hunting season opened in October. More than half of the deaths investigated (26) involve illegal activity otherwise known as poaching. After making the customary adjustments for unknown deaths, about 77 bears are gone or about 11% of the Yellowstone bear population, the core of remaining grizzly habitat. 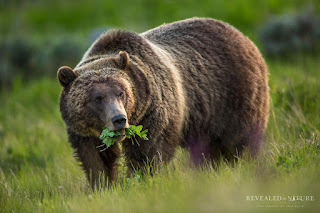 The grizzly population in Yellowstone is no longer rising, and after the record year of 2015 for bear mortality since 1959 when record-keeping began, is probably declining. All of this bad news draws into question the demand for state wildlife officials to subject grizzly bears to trophy hunting next spring. The bears are already suffering the effects of human population growth in the Yellowstone region. People are drawn to the area because of the quality of natural life--clean air, water and abundant wildlife. Yet it is this development that is causing human-bear conflicts and reduction of habitat. Trophy hunting is the embodiment of an archaic human urge to subjugate nature to its purposes, sanctioned by the Judeo-Christian religious tradition. It is in direct conflict with a nature ethic practiced by indigenous people worldwide, and now environmentalists, who want to coexist and harmonize with Earth and its creatures. State wildlife managers see large carnivores as a commodity that can be exchanged for funds by issuing permits to kill. 80-70% of large carnivore deaths in the Rockies can be attributed to sport hunting. Carnivores are simply competitors for edible herbivores such as elk, deer and moose. Whatever else he may be, man is a carnivorous predator; so unenlightened ones are loath to allow other predators a share at nature's table. Subjecting grizzlies to this grim harvest again is not management, but commerce in the time honored tradition of a country founded upon it. It took decades of dedicated effort to bring grizzlies back from the edge of extinction, and it could all be undone in a very short time by a relatively small group of armed, hostile people. Most citizens want to see the great bear survive in the wild--a potent symbol of what is good about America. They come in droves each summer to the Park to see the bear up close. Yet their desires may be thwarted by captured state officials who do the will of a clique of influential businessmen. US Person thinks: Democracy? Not so much.